Retired teacher, experience in journalism and a long time devotee of London theatre. Directed by Jonathan O'Boyle, Danien Tracey Productions in association with Park Theatre and Julie Clare Productions present their 2018 update of the classic JM Barrie play 'Peter Pan' at London's Park Theatre. With few alterations to the original concept, apart from a few 21st century expletives, mobile phones and trendy dress, this is a pretty faithful production. The familiar ingredients are there with the swash buckling Captain Hook, the flights across the stage of Peter Pan and the Darling children, the tick tick tocking of the crocodile and, let's not forget, Nana the Dog, this time in the form of a puppet comprising autumnal leaves manipulated effectively by Alfie Webster. On a relatively small stage area, flights and fighting are well managed, albeit a little slow in pace. Lighting too is effective, with its sinister darkness of greens and swirling mists, present in both the mossy interior of the nursery and in the swamps of Neverland. At this point I might suggest that for the very young viewers, this proved to be a little unnerving. Furthermore this is a two hour production and, apart from moments of levity, demands tight focus and a strong suspension of reality. A difficult ask of very young children and I would think those below the age of 7 might find some aspects a little confusing. So, back to the play. This is a world of make believe, where games are played and pretence is vital. A world where lost children, desperate to be loved, play at happy families whose mothers will care for them and read them stories, whilst fathers will provide for them. Here Peter Pan, Michael and John can play at being pirates and have 'awfully big adventures' but Wendy must provide safety and comfort. Of course, the play was written in 1904 in a world where gender roles and expectations were specific and where allegiance to King and country were the norm. To begin, we meet Wendy (Rosemary Boyle), Michael (Adam Buchanan) and John (Jason Kajdi) in their nursery which has a strong semblance to woodland, with fallen leaves and green moss.The set is dark and mysterious with swirling mists and a sinister ambiance. Neverland retains this effect and, despite the lighter moments, suggests a darker side. The cast of eight play their roles with enthusiasm and an obvious sense of enjoyment. Alexander Vlahos's Captain Hook is a genial character, (think Adam Ant meets Kenny Everett) and Nickolla King-N'Da's portrayal of Peter Pan is charismatic. He is a young boy seeking eternal adventure but with a caring and vulnerable side to his character. He may want to remain a boy forever but recognises the need to protect. Well received by its audience, this is a charming Christmas production. Suspend belief, focus on the complexities and have some fun. Do we believe in fairies? Oh yes, clap, clap, clap. Performances: Tue-Sat evenings, 7.30 pm, Thu & Sat matinees 3 pm. Relaxed Fri 21 December 1.30 pm. Audio described: Sat 4 Jan 3 pm. Prices: Previews £18.50, standard £18.50 - £32.50. Concessions £16.50 - £23.50. Children unde 16 £15 - £20. Premiering at Park 90, a quasi studio space at London's Park Theatre which seats 90 guests, is Jesse Briton's 'A Pupil' directed by Jessica Daniels with music composed by Colin Sell. Performed in the round the setting is sparse, with a splattering of chaos consisting of discarded sheet music, violins suspended and random mess, mirroring the abandonment of hope and joy for Ye (Lucy Sheen) who at the height of her career as a successful and hugely talented violinist was injured in a car accident and now spends her days in her wheelchair, alone with suicidal thoughts. In her life is her joyous landlady Mary (Melanie Marshall) who is a ray of sunshine in Ye's dark world. Forever hopeful and powered by her belief in a greater presence, she delights us with her renditions of Jesus Wants Me For A Sunbeam. The play opens with dishevelled Ye attempting to swallow a cocktail of pills in her bid to escape her now meaningless existence. 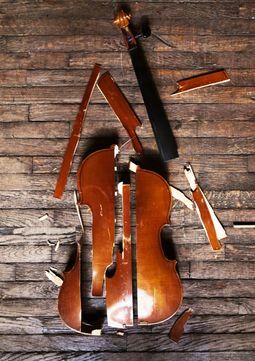 Like a broken violin, she is broken. It is then that 17 year old schoolgirl Simona (Flora Spencer-Longhurst) enters her life. A gifted violinist, self taught but undisciplined, she is required by her billionaire Russian father to audition for the Royal Conservatoire and has been sent to Ye to receive lessons to prepare for this. Simona is angry, defiant and friendless. Accompanying her is Phyllida (Carolyn Blackhouse), once a student with Ye and how a lead tutor at the Conservatoire. But has she abandoned her principles and love of music for an academic career? And this is the gulf that exists for Ye. Greatness cannot and should not be taught or structured. It is inherent and must be given free rein and abandonment. She does not want to discipline the natural wonder of Simona but has she the right to deny her potential? This is a complex psychological drama where relationships are formed, characters develop, bonds are created and self belief is demanded. The script can be ponderous at times and occasionally stilted but once we grow used to Simona's Russian accent and the brusqueness of Ye, we can immerse ourselves into this revealing production and the 90 minutes fly by. There are some effects that will shock and shake you but there are also some delights, such as Marshall's singing and joyfulness and the exquisite violin performances of Spencer-Longhurst. Will you leave the theatre humming and skipping? No, but you will certainly have food for thought. Access Performances: Dementia friendly performance Thu 15 Nov, 1 pm and Audio Described performance Friday 23 Nov 7.45 pm. Prices: Previews £14.50, Standard £18. Concessions £16.50 and under 16s £13. Young Patrons (to 7 Nov) £10. Groups, buy 10 tickets and get the 11th free. 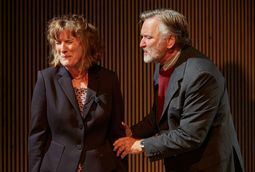 Let me begin my review of Tiny Fines in association with London's Park Theatre revival of Joanna Murray-Smith's 'Honour produced by Paul Robinson that this production features a stellar cast whose performances shine in this somewhat wordy drama about a marital break up. Playing in the round in this intimate space, with minimum obstructive staging, every nuance and expression is captured and the audience, voyeurs to a sparring of words and baring of souls, is drawn in to the unfolding sequence of events which culminate in the brave emergence of Honor, the loyal and dependable wife of successful journalist George. Through their 32 years of comfortable marriage, Honor has fiercely supported her husband in his career whilst holding hers in abeyance as she raises their daughter. It is he who is given the space and independence to flourish. But is her loyalty the act of a martyr? Has she suffocated the excitement by allowing his self grandeur, which has contributed to his inflated ego and selfishness? 'Honour' questions the premise of love and marriage. Does fidelity rely on sacrifice? Is there true honour in loyalty? Henry Goodman plays George, a journalist and TV interviewer in his early sixties. He is in a cosy marriage with Honor, played with strength and integrity by Imogen Stubbs. She was a talented writer and poet who has given up her promising career whilst George has blossomed in his. She shows no resentment, believing this to be the foundation of their successful union. The play opens with George being interviewed by feisty, intellectual Claudia (Katie Brayben) who is writing a book about George. Their sexual frisson in their meeting points towards an inevitable affair. 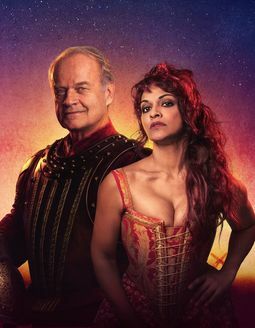 George is besotted with her and in his somewhat late mid-life crisis believes himself to be suffocating, dying in his uneventful marriage with Honor. His cruelty to her as he reveals his boredom and declares the end of the life they share is powerful, and whilst it raises anger in his daughter Sophie (Natalie Simpson) and in the audience, the enforced separation ironically empowers Honor who emerges like a chrysalis to a future full of promise. Each of the four is entirely credible. Henry Goodman as George has bouts of anger and frustration but he is not the strong partner of this marriage. 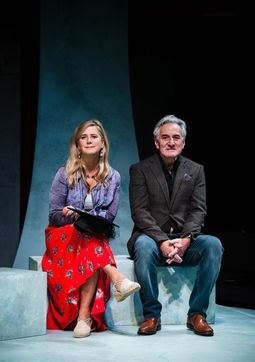 It is Honor, played by Imogen Stubbs whose performance is powerful and who takes us with her through the strong emotions of her shock at the dissolution of her 32 year safe, married life. Daughter Sophie and journalist Claudia express the insular views of the young. They will not sacrifice their lives for anyone and cannot envisage a partnership that has such expectations. 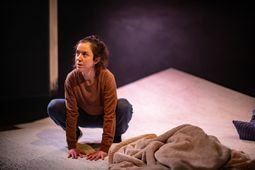 Liz Cooke's minimalist set is reminiscent of a boxing ring, where the actors circle one another attacking and defending through their sparring of words, delivered with punch and verve. There are no gimmicks, no scene changes, but two acts and a purity of theatre. 'Honour' is a strong play, highly charged through a dialogue which is well written and poignant.The acting is superb. Stubbs convinces as the shocked wife whose life seems to be over. How will she manage or face her future? She is defined by her marriage to her husband. Goodman is the perfect match, believing he has found new meaning to his relentless life but who in fact is reduced by this. Katie Brayben is convincing as the careerist Claudia and Natalie Simpson reacts strongly as a daughter betrayed. This is not a 'bourgeois fairy tale' (Claudia) but a piece of excellent theatre and a master class in acting. It was a privilege to be there. Dates: 25 October 2018 to 24 November 2018. Having played in various venues in the US, Shaar White's The Other Place has crossed the pond to its London venue, the Park Theatre (Finsbury Park) under the skillful and talented direction of Claire van Kampen and her fabulously talented cast of Karen Archer, Eliza Collings, Neil McCaul and Rupinder Nagra. 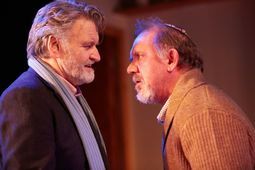 This is a production not to be missed and I would recommend that you try to get tickets at this venue which offers close proximity to the actors and a superb setting, enhanced by the considered set design (Jonathan Fensom) and wonderful lighting effects (Paul Russell). 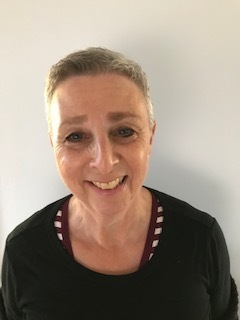 Quick witted, feisty, sardonic are terms which could sum up our protagonist Juliana (Karen Archer) who first appears on stage as a highly successful neurologist, presenting her lecture on brain activity to doctors in the audience. She has spent years researching the decline of brain neurons which lead to dementia and is a leading professor on this topic. A strong woman, controlling and confident, who sadly declines into the mental confusion of her degenerating mind. Did she really see a bikini clad doctor among her audience? And as we progress, we are aware that she has crossed the line of reality and entered into delusion, where her need for truth creates a new reality and meaning. During her lecture, Juliana recognises that she is experiencing 'episodes' and seeks a medical diagnosis, hoping that she will be the victim of a curable brain tumour. That would certainly explain her behaviour and would thus be acceptable. But this is not the case and, without giving too much of the script away, we see the ironic and devastating decline of this expert in her field. Both Eliza Collings and Rupinder Nagra (cast as the Woman and the Man) play different roles in the reality/unreality of Juliana's behaviour. As spectators, we are confused as to what is actual and what is an illusion, raising the question of whether reality exists only in the experience of its owner. Performances are immensely poignant and Archer's portrayal of Juliana's agony is sublime. Her performance is fearless and she exposes the desperation of the experience in the character's more lucid moments.Now we understand her cruelty and barbed humour. It is a mask under which lies her unfolding tragedy. She is a woman 'in between' who has created strategies to deflect from pain and vulnerability. The Other Place takes its title from the second home on Cape Cod, where the couple had spent many happy times together. But it serves too as a metaphor for the other place where there might be a mental refuge of safety from the cruelty of confusion and unreality. I cannot praise this production highly enough and would urge you all to go and see it. Passing through the gathered throng who were assembling in the foyer at the close of the play, all were sharing the same reaction. This is a wonderful play performed with strength, integrity and credibility by its committed and fabulous cast. 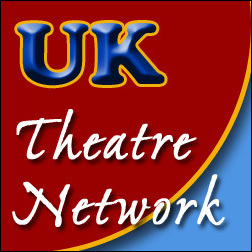 A Park Theatre and Theatre by the Lake co-production in association with Abinger Productions. Evenings 7.30pm, Thu & Sat Matinees 3pm. Bonnie's back in town and boy can this gal sing and dance! Last night saw the Gala Performance of 42nd Street, with the fabulous Bonnie Langford in the role of Dorothy Buck, the troupe diva who is to perform 'Pretty Lady' under the ambitious direction of Julian Marsh (Tom Lister).Ironically her role demands her inability to dance! Langford plays it with gusto and humour, belting out her numbers with energy, enthusiasm and power. And don't worry, we are treated to her amazing tap dancing skills in the grand scale finale and wow, she is a joy. So, taking our seats, we waited for the famous rise of the curtain which would reveal the fantastic tapping of the ensemble's fast moving feet. The orchestra sounded and conductor, Jae Alexander, turned to the excited audience with a delighted grin which spread from ear to ear, inviting us in to share this fabulous spectacle and slick production. And so it was. Engaged and enthralled we settled into our seats to watch the brilliance of the talented cast under the fantastic direction of Mark Bramble, to soak in the elaborate and magnificent sets (Douglas W Schmidt) and relish the exciting choreography (Randy Skinner). And let's not forget those brilliant costume changes that seemed to happen in mere seconds only. With those familiar numbers which include: 'Keep Young and Beautiful, I Only Have Eyes for You, We're In The Money, Lullaby of Broadway, Shuffle Off to Buffalo and, of course, 42nd Street' we were treated to a wondrous evening of spectacle and delight, mesmerised by the speed of the hoofers' tapping. So much talent in one evening. Clare Halse was formidable in her role of Peggy Sawyer and left the audience gasping as she sped on her taps around the stage. 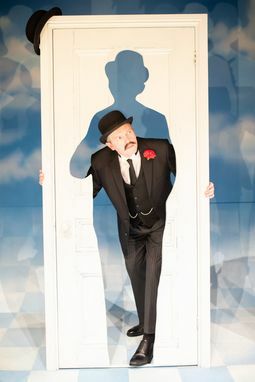 Ashley Day as Billow Lowlor was exhilarating in his role, giving genuine pleasure and enjoyment to his performance with his glorious smile and wonderful voice. And of course Jasna Ivir and Christopher Howell, playing Maggie Jones and Burt Betty, gave the production its authenticity. Praise to the nostalgia and escapism, no more so than in the splendour of the full ensemble in their lavish, sparkling costumes performing '42nd Street' with its magnificent staircase and Busby Berkeley mirror effect. Delightful! And as the performance ended, the audience erupted into cheers and, in almost choreographed unison, rose to their feet as one. Hands ached with the applause, not least for the fabulous orchestra with many hanging back to hear its last strains after the curtain had fallen. Go see it - you must! Playing until January 2019, Bonnie Langford is a superb addition to complement this wonderful cast. Her energy is mischievous and feisty and it is clear that she enjoys every moment. As my husband said, 'What's not to enjoy?' Cheers to that and now I must dust off my tap shoes and rejoin a class. PERFORMANCE TIMES Monday-Saturday 7.30 pm, Wednesday and Saturday matinees 2.30 pm.